Kerala is reeling under the biggest natural disaster after 1924. With the second largest flood that the State is facing, for the first time in the history of Kerala that all the 27 dams have been opened at the same time. “Such devastation has never before been witnessed in the State. Kerala is struggling hard with loss of nearly Rs.20000 crore infrastructure. To help the cause for Kerala, Starobe is giving an opportunity to all the people to raise funds through a unique campaign. All the proceeds from this campaign will be forwarded to Kerala Relief fund. In this campaign, all of you can donate in multiples of 1000s with Rs.1000 as minimum. Everybody who donates will be sent a free Naa Peru Surya Styled T-shirt from Starobe, as a token of gratitude. 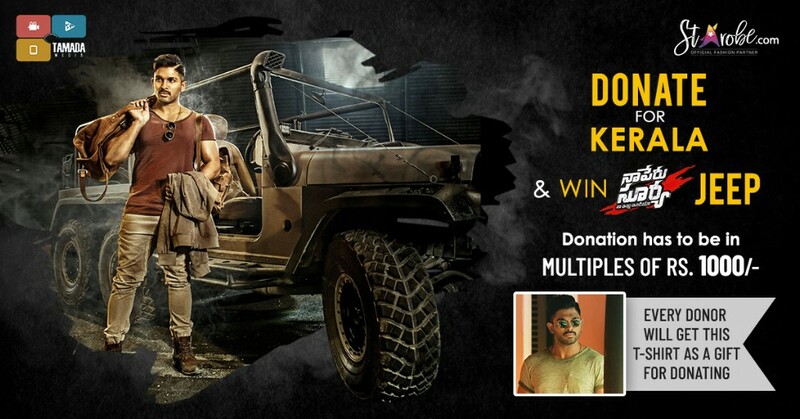 One of the lucky winners will win the Unique 6x6 Mahindra Thar Jeep that has been created specifically for Naa Peru Surya Movie. We thank Mr Lagadapati Sahidev Vikram for his courtesy and support for the campaign. Hope you spread this and make everyone aware.